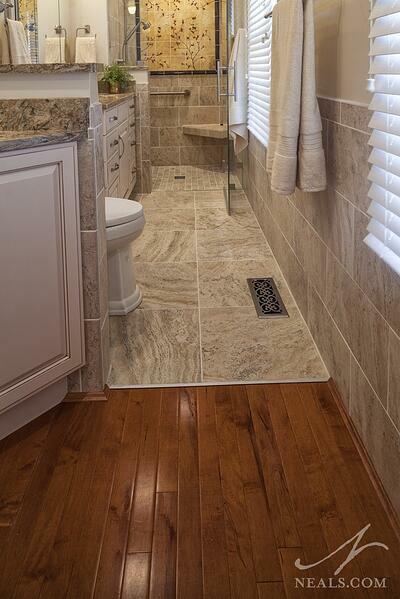 Originally, this master bathroom was tucked away past a small foyer-like space just off the master bedroom. The narrow bathroom beyond had a practical layout, but lacked style and felt like a closet. 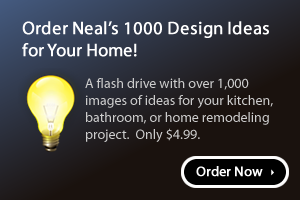 The main goal of this remodel was to create a unique space by combining the two spaces into a single room, increasing storage and usability. 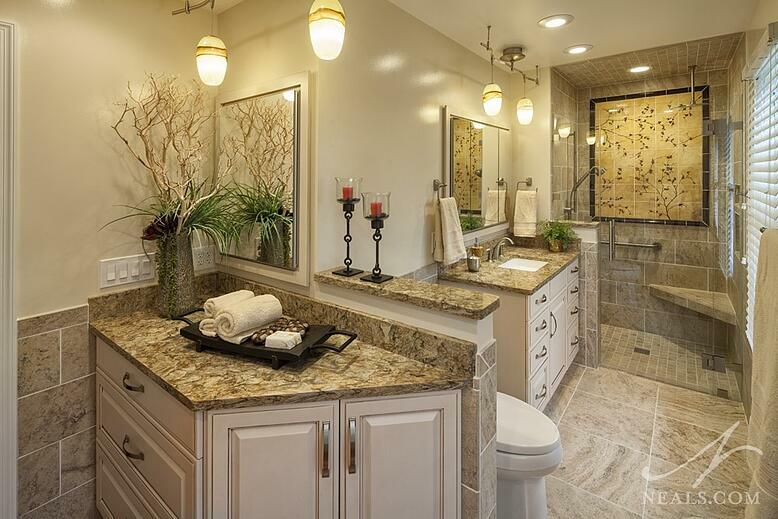 Challenge: The homeowners did not want a “cookie-cutter” design. They wanted a unique space, but also one that suited the suburban home. 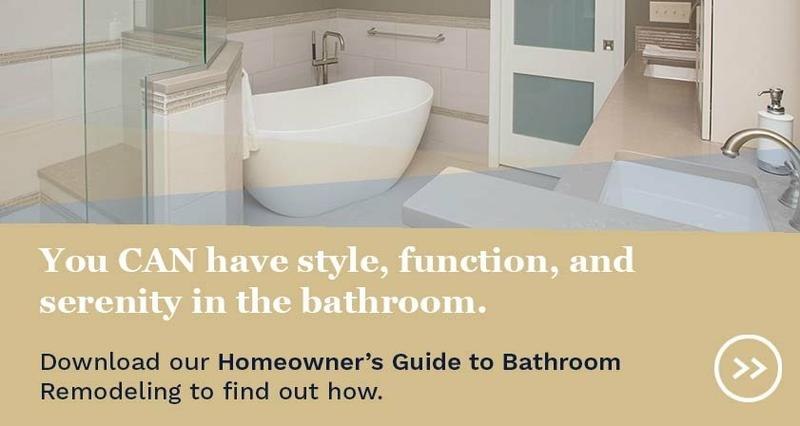 Solution: The two areas off the master bedroom were opened up to each other, creating a unique L-shaped bathroom. A cherry blossom tile mural was chosen as a focal point in the room, and artisan glass pendants in a matching color-way add a handmade quality. Traditional cabinetry and materials combine with contemporary details, such as the sleek, satin nickel hardware and modern, wavy track for the pendants, create a hybrid space that doesn’t fall into a single style category. Challenge: The homeowners were looking for an accessible space but also required increased storage in the limited square footage. Any storage solution had to also retain or improve the room’s flow. 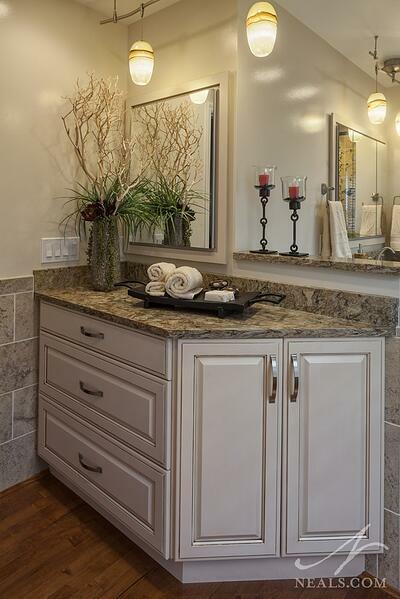 Solution: The existing vanity, a builder-grade single-bowl unit with just one large space behind the 2 cabinet doors, was replaced with a custom vanity. The new single bowl sink is arranged between two columns of drawers, with a single cabinet directly below. 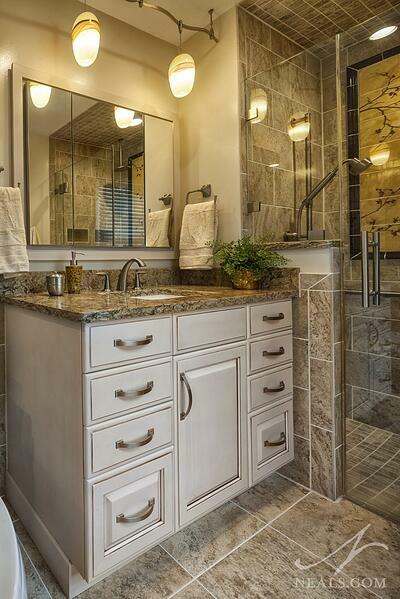 The vanity was replaced with a streamlined cabinetry solution. The end cabinet is set at an angle to allow for easier flow around the room’s corner. The large new drawers here not only replace the vanity storage, they offer additional space for storing extra toiletries and towels. Both of the mirrors in the room are medicine cabinet style mirrors to hold smaller items. They were placed in frames made from simple trim to subdue their utilitarian look and help integrate them. 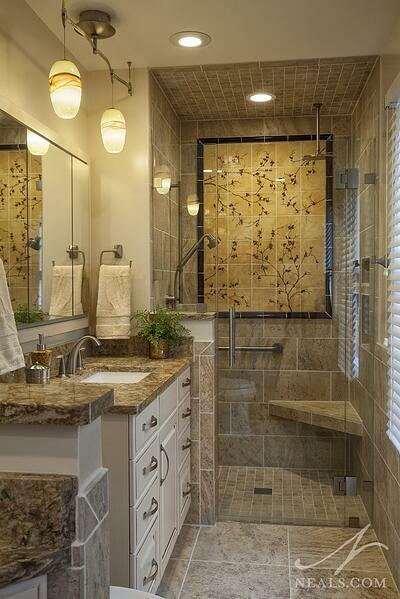 Challenge: The homeowners wanted an accessible, universal design shower. To accommodate this, new plumbing would need to be included into the existing, available space. Solution: The new curbless shower was designed for safety and ease of use. To keep the stall from feeling too small, a glass enclosure was selected and a light was installed above. Two shower heads were installed – a hand-held and a rainhead. The rainhead is centered on the corner bench. 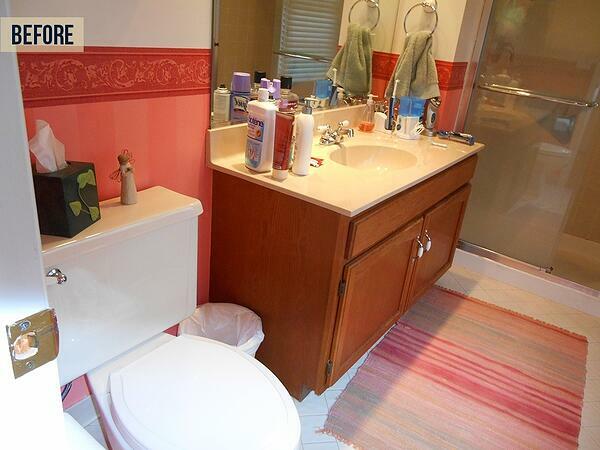 Challenge: The floor in the bedroom had been recently replaced and extended into the vanity area. The homeowners dictated that the wood floor had to be retained and worked into the overall material design scheme. 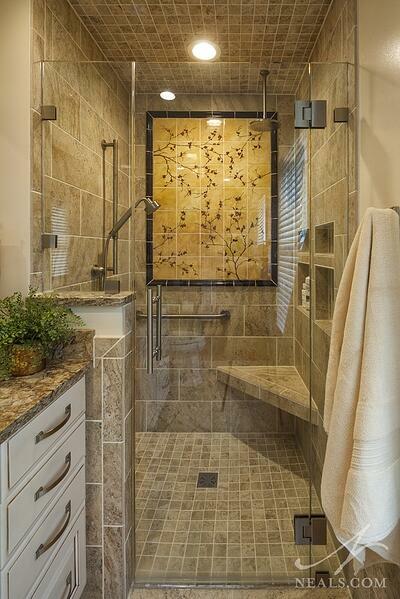 Solution: The rich color of the floor was given a nod with the mosaic in the shower. The combination of the warm yellow background, dark red border tile, and red blooms add richness to the room’s color palette. Rust-orange in the glass pendants also ties it all in. The Cambria counter, Buckingham, is veined with warm brown that helps create the leap to the pale tan color of the tile work. The tile floor is heated for an additional spa feel in the space. Challenge: The homeowners wanted to retain some privacy in the now opened space. 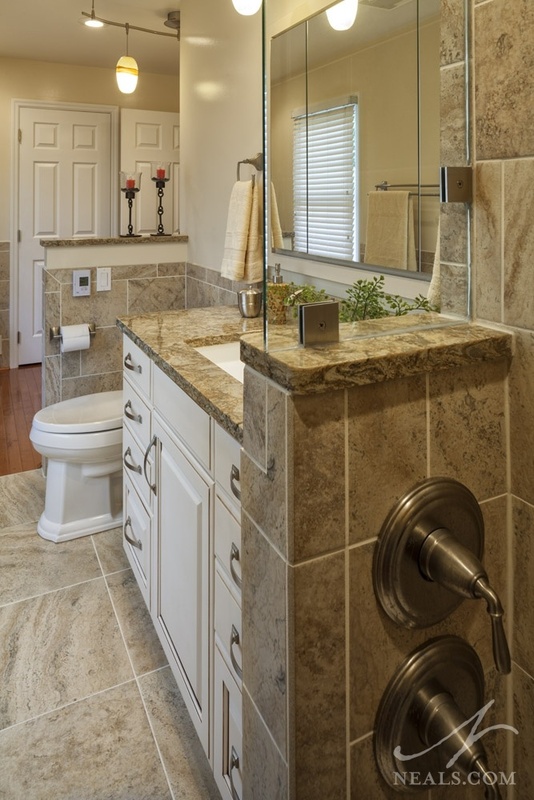 Solution: With the loss of the full wall and door between the vanity area and the bathroom, privacy from the bedroom had been compromised. To balance this, a half-wall was used to create a barrier in the view from the bedroom door and new vanity area to the commode.